I also dogeared my paperback copy of his huge collection of “Future History” stories The Past Through Tomorrow, reading them over and over again. 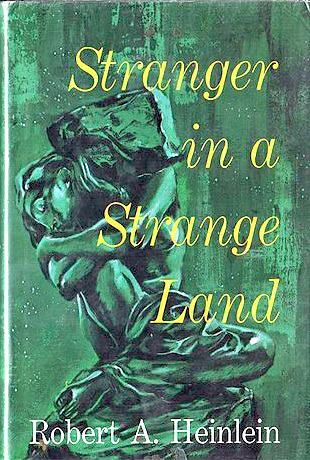 But Stranger in a Strange Land is arguably Heinlein’s greatest novel, and my favorite. When Stranger was originally published in 1961, Heinlein cut the original 220,000 word text back to 160,000 words, and this first published version was what I initially read (and reread) as a teen. In 1989, Heinlein’s widow arranged to have the original manuscript published, restoring all the material cut from the 1961 version. I have read both, and probably would recommend the 1989 uncut version to someone reading Stranger for the first time – both versions are good actually, but the uncut version adds a lot of detail (and entertainment) I am glad is there, and by 21st century standards, 220,000 words is still not that long (compared to 1961 standards). Heinlein takes every sacred cow and turns it on it’s head: religion, sexuality, the family – his characters extol free love, communal living, and even cannibalism. Stranger in a Strange Land was a deliberate attempt to get readers to examine and question social conventions. 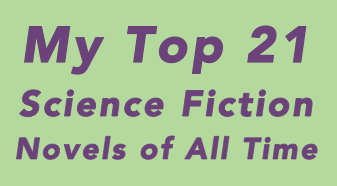 The novel’s protagonist Valentine Michael Smith is probably Heinlein’s most perfectly realized character – the child of two human astronauts born on Mars, orphaned, and raised by Martians, he returns to Earth as a young man with what appear to be supernatural abilities. And the fun begins! Don’t miss this one.